Commercial seaport city in the counties of Gloucester and Somerset, England. 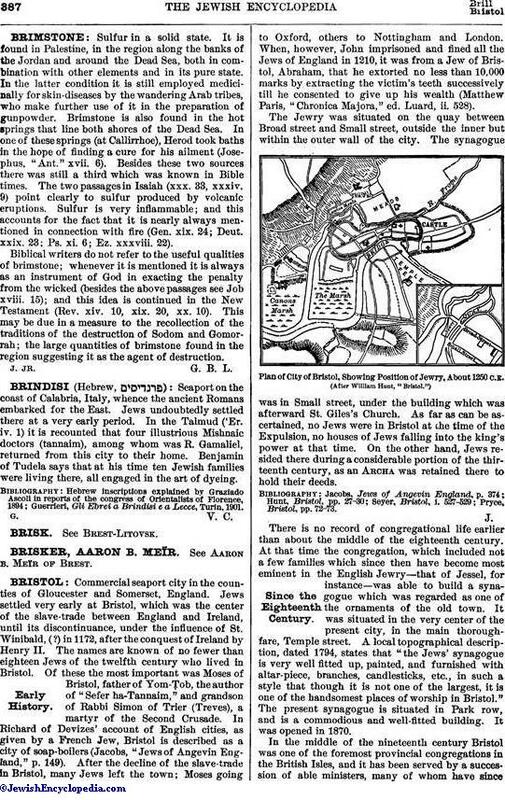 Jews settled very early at Bristol, which was the center of the slave-trade between England and Ireland, until its discontinuance, under the influence of St. Winibald, (?) in 1172, after the conquest of Ireland by Henry II. The names are known of no fewer than eighteen Jews of the twelfth century who lived in Bristol. Of these the most important was Moses of Bristol, father of Yom-Ṭob, the author of "Sefer ha-Tannaim," and grandson of Rabbi Simon of Trier (Treves), a martyr of the Second Crusade. 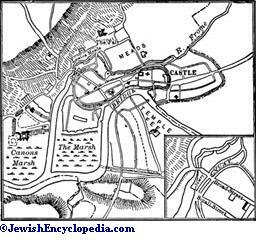 In Richard of Devizes' account of English cities, as given by a French Jew, Bristol is described as a city of soap-boilers (Jacobs, "Jews of Angevin England," p. 149). After the decline of the slave-trade in Bristol, many Jews left the town; Moses going to Oxford, others to Nottingham and London. When, however, John imprisoned and fined all the Jews of England in 1210, it was from a Jew of Bristol, Abraham, that he extorted no less than 10,000 marks by extracting the victim's teeth successively till he consented to give up his wealth (Matthew Paris, "Chronica Majora," ed. Luard, ii. 528). The Jewry was situated on the quay between Broad street and Small street, outside the inner but within the outer wall of the city. The synagogue was in Small street, under the building which was afterward St. Giles's Church. As far as can be ascertained, no Jews were in Bristol at the time of the Expulsion, no houses of Jews falling into the king's power at that time. On the other hand, Jews resided there during a considerable portion of the thirteenth century, as an Archa was retained there to hold their deeds. Plan of City of Bristol, Showing Position of Jewry, About 1250 C.E. There is no record of congregational life earlier than about the middle of the eighteenth century. At that time the congregation, which included not a few families which since then have become most eminent in the English Jewry—that of Jessel, for instance—was able to build a synagogue which was regarded as one of the ornaments of the old town. It was situated in the very center of the present city, in the main thoroughfare, Temple street. A local topographical description, dated 1794, states that "the Jews' synagogue is very well fitted up, painted, and furnished with altar-piece, branches, candlesticks, etc., in such a style that though it is not one of the largest, it is one of the handsomest places of worship in Bristol." The present synagogue is situated in Park row, and is a commodious and well-fitted building. It was opened in 1870. In the middle of the nineteenth century Bristol was one of the foremost provincial congregations in the British Isles, and it has been served by a succession of able ministers, many of whom have sinceachieved distinction in larger spheres of work. The earliest known of these were the Rev. David M. Isaacs (afterward minister and professor at Liverpool and Manchester) and the Rev. Abraham Barnett (afterward of the New Synagogue, London). The Rev. Aaron Levy Green, afterward eminent as minister of the Central Synagogue, London, was stationed at Bristol from 1838 to 1851, taking locally a share in the emancipation struggle which attracted the notice of Sir Moses Montefiore, and preaching occasional English sermons, at that time a very rare feature of Anglo-Jewish devotions. Among other Jewish divines attached to the congregation may be mentioned the Rev. Isaac Samuel (now minister of the Bayswater Synagogue, London); the Rev. Meyer Mendelssohn (afterward minister at Kimberly, Cape Colony); the Rev. Burman Berliner (afterward minister of the St. John's Wood Synagogue, London); the Rev. Joseph Leonard Levy, B.A. (lately attached to Congregation Keneseth Israel, Philadelphia, and now rabbi of Congregation Rodeph Shalom, Pittsburg); the Rev. Moses Hyamson, B.A., LL.B. (afterward minister of the Dalston Synagogue, and now dayyan of the United Synagogue, London); the Rev. Lewis Mendelssohn, B.A. (afterward of Dublin); and the Rev. Joseph Abelson, B.A., the present minister. Of recent years, and concurrently with the revival of the West-Indian trade and the enterprising enlargement of the port, an increase of the Jewish population has become evident, and much activity is again being brought to bear on communal work. In addition to the Ladies' Benevolent Society, dating from about 1860, there exist a board of guardians (founded 1894); a Hebrew school (founded 1890), the classes of which are attended by seventy children; a literary and social society (founded 1894), with fifty-one members; and a Zionist association (1899). Jewish organization is not confined to the residents in the city itself. At the great public school, Clifton College, situated in the suburbs, there has been for some years a Jewish house—that is, one of the residences forming part of the collegiate buildings—the domestic life of which is carried out in accordance with Jewish custom. The master presiding over this house is the Rev. Joseph Polack, B.A., previously minister of the Liverpool (Old) congregation. It has existed long enough to form a tradition in the college; and its first generation of students has already taken a leading position in Anglo-Jewish communal life. 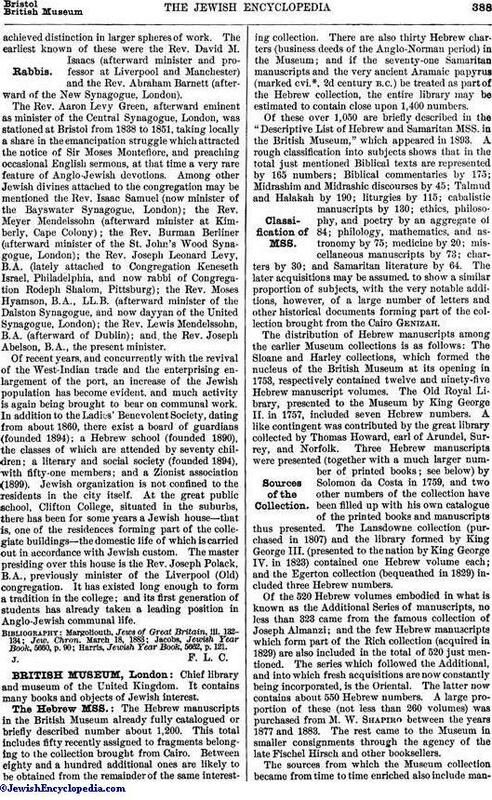 Harris, Jewish Year Book, 5662, p. 121.